There are two ways your business can operate in today’s technological climate: proactively and reactively. Most companies don’t need convincing that technological advancements are worth investing in, but there are programs and services that companies often ignore due to a lack of understanding and/or perceived costs. Thousands of companies are proactive when it comes to adopting cloud computing services such as SaaS and IaaS, but how many of them are proactive when it comes to system uptime management? Uptime refers to the average amount of time that your services, software programs and website are actively connected and accessible. There are companies that roll the dice and cross their fingers that the network will always be accessible, email service in the office will run smoothly and security breaches won’t be a problem, but the truth is that no company is immune to the dangers of system outages and downtime. Have You Considered the Cost of Downtime? This gives you a rough idea of how much money you are losing when you are paying employees that are not able to remain productive. When it comes to the impact outside the office, you can further determine the cost of downtime by multiplying the average online income for your business by the total number of hours the system was down. This gives you an idea of lost income during downtime. Other factors to consider as a result of downtime include reduced productivity, website downtime and damage to your brand image. Research from the Aberdeen Group suggests that IT downtime costs businesses an average of $163,674 per hour. Understanding the impact of IT downtime requires vision beyond the walls of your office. When your network goes down, employees lose access to the web, software programs, data files and email. Beyond the office, your customers lose access to the company website and mobile apps powered by your network. Take, for example, the impact of a 2013 outage at Amazon.com. Yes, employees at Amazon lost connectivity and productivity dipped, but that was not the extent of the damage suffered by the company. With the company’s website offline and its mobile app unreactive, customers could not make purchases. The 49-minute outage reportedly cost Amazon.com $5 million in sales revenue alone, not to mention the cost of working hours lost for its employees. In other cases, the cost of downtime is calculated in dollars and in terms of reputation. Northrop Grumman suffered a public relations headache in the summer of 2010 when it suffered from IT downtime. The outage lasted more than a week and affected a number of state agencies in Virginia. In addition to damaging the reputation of Northrop Grumman, the extended downtime resulted in a $5 million payment to the Commonwealth of Virginia. Despite the risks associated with IT downtime, 56% of companies in North America have failed to adopt a disaster recovery plan. Setting up a disaster recovery plan involves establishing policies, processes and procedures that must be followed in the event of downtime. A disaster recovery plan defines a roadmap for the employees and the company as a whole to follow when disaster strikes your IT network or other business functions (i.e. power loss, network maintenance, natural disaster, etc.). Preventive measures: efforts to prevent disasters from occurring, such as load balancers that evenly distribute network traffic across multiple servers to ensure the failure of one server doesn’t negatively impact your entire operation. Detective measures: efforts to seek out and prevent unwanted events, such as antivirus software that prevents hackers from infiltrating and crippling your network. Corrective measures: efforts to ensure your business processes, systems and data can be quickly recovered in the event of a disaster. With a proper disaster recovery plan in place, your company will be able to better manage downtime when it occurs and quickly recover operations and processes to get your business back up and running. 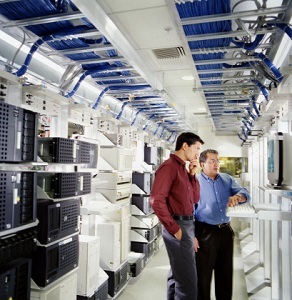 To work with a disaster recovery plan specialist, request an assessment.